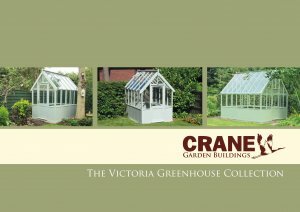 Our timber framed Victoria Greenhouses are an iconic, elegant Victorian design. They are generously proportioned with plenty of height and a steep roof pitch. 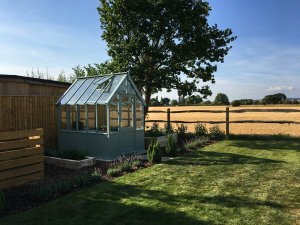 Our Greenhouses are an attractive choice for the serious gardener, providing the perfect place to build-up a kitchen garden or nurture exotic plants. To design your own Greenhouse, please click on the Create My Greenhouse tab below. The concept of a greenhouse has been around for a very long time, dating back to Roman times: Emperor Tiberius would have a cucumber-like vegetable grown for him throughout the year to allow him to eat one each day. Then later on, the Italians housed exotic plants brought back by explorers in primitive greenhouses. 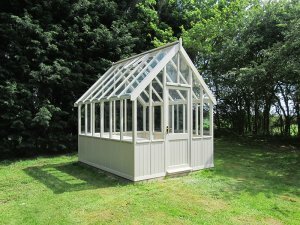 For the United Kingdom, it wasn't until the Victorian era that greenhouses became popular: in 1851 the tax on window glass was repealed, meaning that glass became affordable. Exhibition greenhouses enjoyed their golden age where the well-heeled Victorians would spend their increasing leisure time amongst unusual and exotic plants, the most iconic of which was England's Palm House in Kew Gardens. 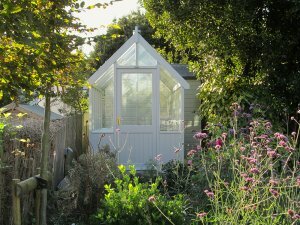 Over time, greenhouses have become more affordable, with varying different designs and materials being used. 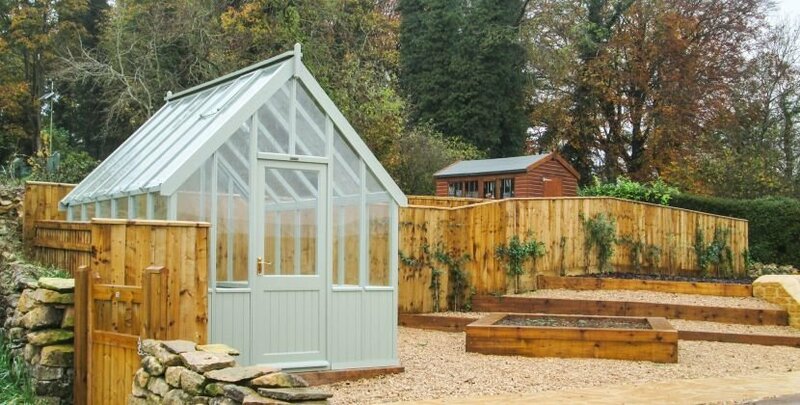 With our range of the Victoria Greenhouse, we have stayed true to our roots, and use timber for the frame, a natural, durable material that sits harmoniously in your garden, in a traditional, elegant Victorian-esque design. 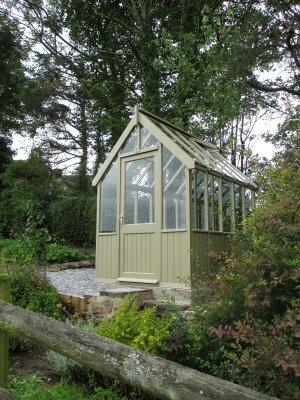 Our Timber Greenhouses are available in one of two paint colour ranges: Valtti or Farrow & Ball. 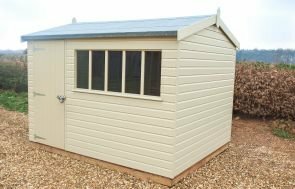 Both of these paint ranges offer an opaque finish with a long re-decoration cycle in a wide range of natural colours that will fit perfectly into garden environments. Please see below for information on both paint ranges. Slatted benches and roof vents are details that help make our Greenhouse a practical, as well as attractive, solution for your Greenhouse requirements. You can add one or two slatted benches to your greenhouse to help with your potting needs, or you can choose not to have any at all. The benches are made using oak faced plywood and finished using the same paint colour as the exterior. The roof vents come as standard with your Greenhouse: there are two in each greenhouse, one on either side of the roof, and are temperature controlled to automatically open to help ventilate the room inside when it gets too warm. Our Greenhouses must sit on a concrete base for stability, and do not come with a floor. Please see below for more information on concrete bases. Construction - Planed tongue and groove ex 19 x 100m, corner posts ex 70mm, uprights ex 50mm: all using high grade FSC certified northern Scandinvian Redwood. Glazing - We glaze the Greenhouse with 4mm thick toughened safety glass. Door - The door is a half-glazed, joinery made door. 1900 x 750mm (high x wide), and glazed using 4mm thick toughened safety glass. The door is fitted with a 5 lever mortise lock, and polished brass door handle. Roof Vents - There are 2 automatic opening vents in the roof that are fitted into all our greenhouses. They are temperature controlled to help with essential ventilation. Flooring - The Greenhouse does not have a floor; it sits directly onto a concrete base. Paint - Externally, you can choose between two paint systems: Valtti and Farrow & Ball. Both paint systems offer an opaque coverage and have long re-decoration cycles with a wide range of natural colours to choose from. For more information, please see the Paint Ranges section within the Options tab.